CMO™ is not a conventional product. There's never been anything like it before. The trademarked designation “CMO™” applies exclusively to cerasomal-cis-9-cetylmyristoleate and to no other product. We must emphasize that cetylmyristoleate is not CMO™, nor is CMO™ any sort of generic chemical designation. Cetylmyristoleate was not developed for oral administration. CMO™ was developed for oral administrtion. As a result, it is 40 - 200 times more easily absorbed making it very effective. WITH CMO™ RELIEF IS JUST A SHORT TIME. 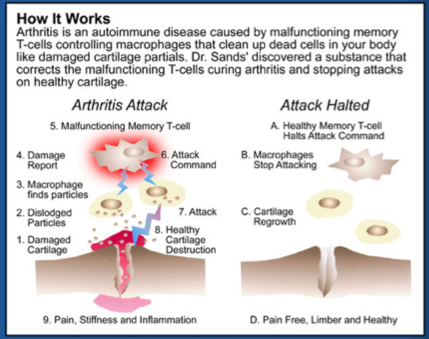 Most users report significant relief from arthritis pain and inflammation in a short time. Even in severe cases. In some cases perseverance will pay off at the end. Follow the instructions that come with the package or the information on the Dosing/Guidelines page. Authentic CMO™ is not like many medicines that are toxic. It is not even like the several types of vitamins that are toxic at high levels. The CMO™ has been tested and shown to have no ill effects whatsoever. To date thousands of people have used it to relieve the symptoms of arthritis and there are no reported ill effects from anyone. It works for both osteoarthritis and rheumatoid arthritis. It works for all other types of arthritis except gouty. The CMO™ Kit has been effective on nearly everyone. CMO™ almost always provides relief of pain, swelling and return of mobility. It is important to follow the diet and protocol recommended to obtain good results. CMO™ is the commercial name for cerasomal-cis-9-cetylmyristoleate. It is naturally derived from beef. Similar substances have long been used in common foods including cheese and chocolate. A high percentage of doctors preffer pharmaceutical products due to their training, but a good number of doctors have experienced how natural is better. CMO™ is natural, drug free and non-toxic.